Do cucumbers contain lectins that are likely to set off food sensitivity reactions? Sometimes these reactions are also called food intolerance or lectin sensitivity reactions but are most commonly thought of simply as symptoms. So, are cucumbers high in lectins that can cause negative reactions? Are Cucumbers High In Lectins? Research indicates that lectins in cucumbers are very unlikely to cause food sensitivity reactions, which is obviously an important factor in deciding which lectins to avoid - how they make you feel. Below is some information regarding reactions to cucumbers. The question "are cucumbers lectin-free" can actually be confusing. There are many foods that contain lectins, however, the question that you probably want the answer to is whether cucumbers have lectins that can set off reactions that make the person feel worse. Our research shows that cucumbers are a great addition to a lectin-free diet, and our experience matches that as well. You can also note that in the information above, the parts tested were the cucumber fruit, rind, and seed. So even the skin and seeds of cucumber should prove no problem. While many foods contain lectins, you probably just want to avoid the ones that make you feel worse. This approach is one that can prove highly effective, and of course in selecting what foods to eat and not to eat, you do need some sort of strategy. If you listened to every piece of advice about what to eat and what not to eat, you would literally have nothing to eat! If you want to know how I was able to ​increase my ​tolerance to lectin foods, so that I could be way more flexible and not worry about eating out at restaurants or get togethers, then be sure to​ join our poweful insider's list by clicking the button below. 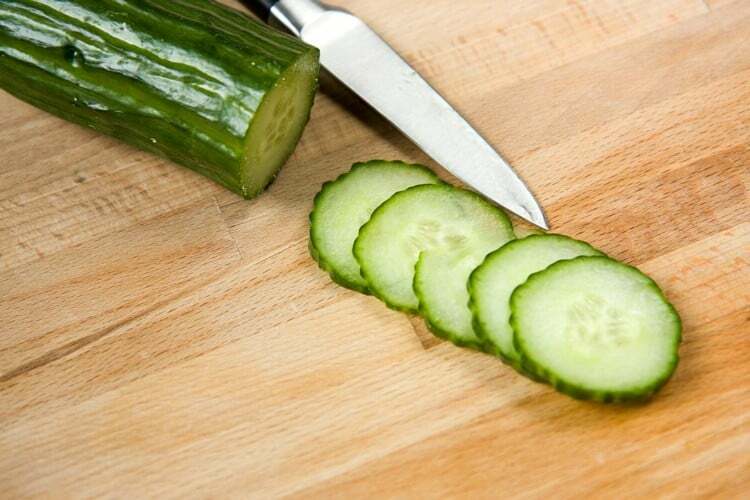 Cucumbers can be sliced and eaten raw in a salad after washing with water or eaten with a bit of salt to taste. Additionally, cucumbers are fantastic as a part of juice. Consider using roughly half a cucumber and the rest celery. What you'll have is a very mild tasting juice that makes your tummy feel good and provides a variety of health benefits. You can also add carrots which will overwhelm most of the other tastes. In order to make your own juice, you can use a juicer, which is different than a blender. The juicer will get rid of most of the pulp, etc. so that the fibrous parts are not included - leaving mostly juice. Since the body does not need to digest the fiber, you're left with a nutrient-dense juice that is easier to digest. Cucumbers contain a variety of vitamins, minerals, and other aspects that make it a nutritious and good food to eat. While made up of mostly water, the cucumber is actually praised for its ability to ward off water weight. It has been said to be hydrating, while also helping flush out toxins and water. Cucumber water is often offered to help hydration and cucumber slices used in spas, etc. to help rejuvenate the skin, get rid of eye circles, and reduce inflammation. Like many other fruits and vegetables, it's also been shown to have antioxidative powers. It is considered a fruit, not a vegetable as many would think, and you can distinguish vegetable-looking fruits as fruits due to their seeds. Perhaps best of all, consuming raw cucumbers offers you natural raw enzymes in their purest form, helping with digestion of foods. Our research indicates that cucumbers are low in lectins and also that they are a good, nutritious food to include on a low-lectin diet. Whether you are sensitive to lots of foods or not, cucumbers can be powerful food to add to your diet. If you're wondering what foods containing lectins are likely to set off food sensitivity reactions and would like ​to ​feel ​​awesome with the lectin-free diet​, then check out this guide. Want to eat more lectin foods while still feeling good? ​If you are looking to make it easier to eat lectin foods, while still feeling awesome afterwards, you can check out ​more on how I did that ​by joining our powerful insider's list below when you click the button below.